Palm warblers (Setophaga palmarum) come in two colors — yellow and brown — and both are seen in Pennsylvania during migration, but we rarely see them together. They follow different paths and have different destinations. 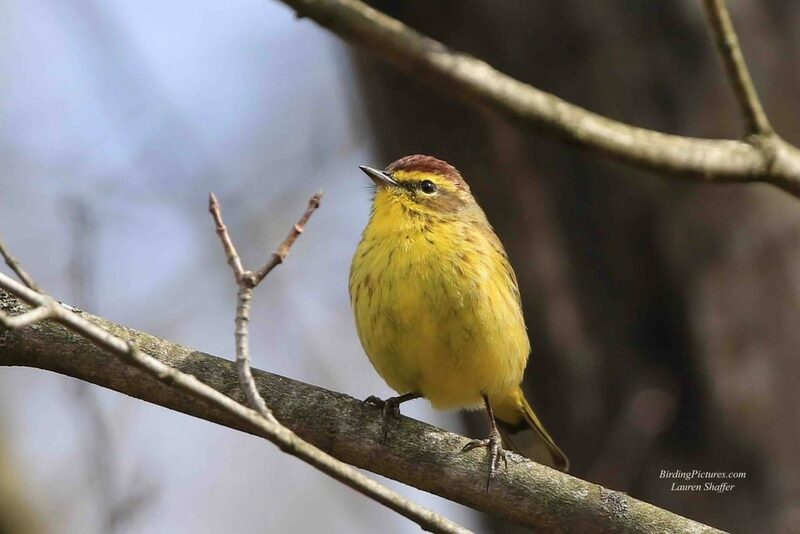 Lauri Shaffer (birdingpPictures.com) found a yellow palm warbler at Montour Preserve in eastern PA in early April, above. Bobby Greene photographed a brown one on migration in Ohio a few years ago, below. The colors indicate the two subspecies — yellow and western (brown) — that breed in different places, cross over on migration, and overlap their range in winter. The typical range maps don’t tell the story. Two subspecies of the Palm Warbler exist, easily identified in the field. [They] inhabit separate breeding grounds but overlap on their wintering grounds. 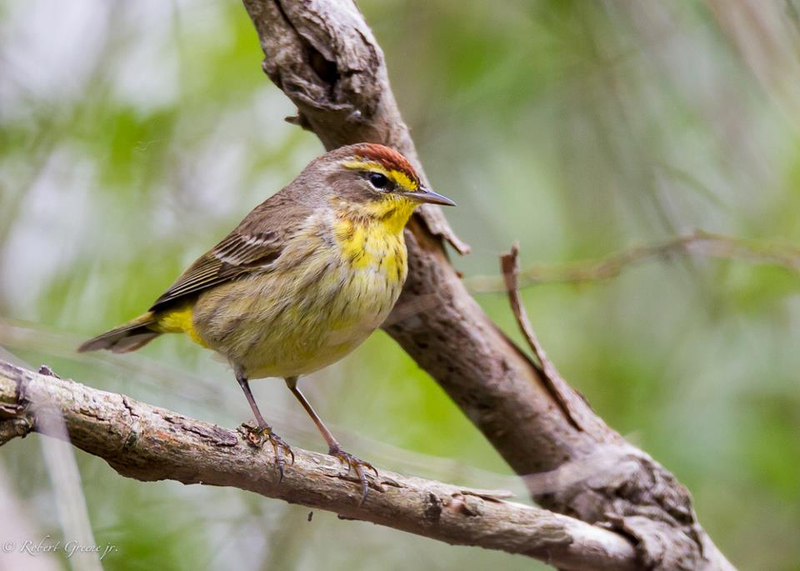 The Western Palm Warbler (S. p. palmarum) nests roughly west of Ottawa, Ontario and winters along the southeastern coast of the U.S. and the West Indies. The Yellow Palm Warbler (S. p. hypochrysea) nests east of Ottawa and winters primarily along the Gulf Coast. 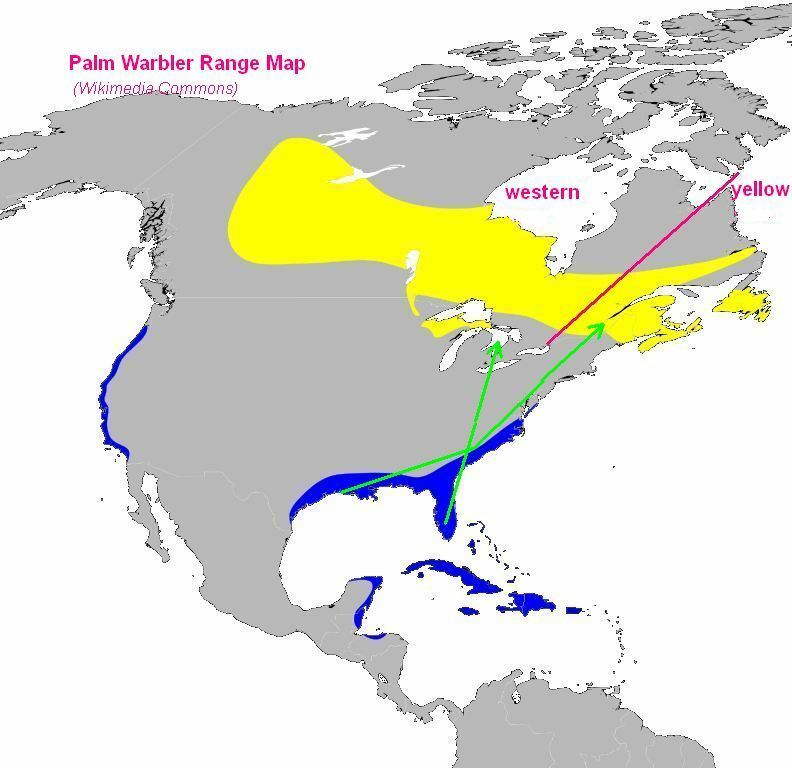 For the quickest way to their breeding grounds “yellow” crosses to the Atlantic Flyway in the spring (green arrow going east) while “western” crosses to the Mississippi-Ohio watershed (green arrow going northwest). Their breeding grounds divide at the pink line. On the map it would look like this. If you’re in the Florida Keys in February you’ll see both of them, as Chuck Tague did when he made this slide. But don’t expect to see them both in Pittsburgh. Ours are the western palm warbler. It’s a rare day when we find a yellow one. 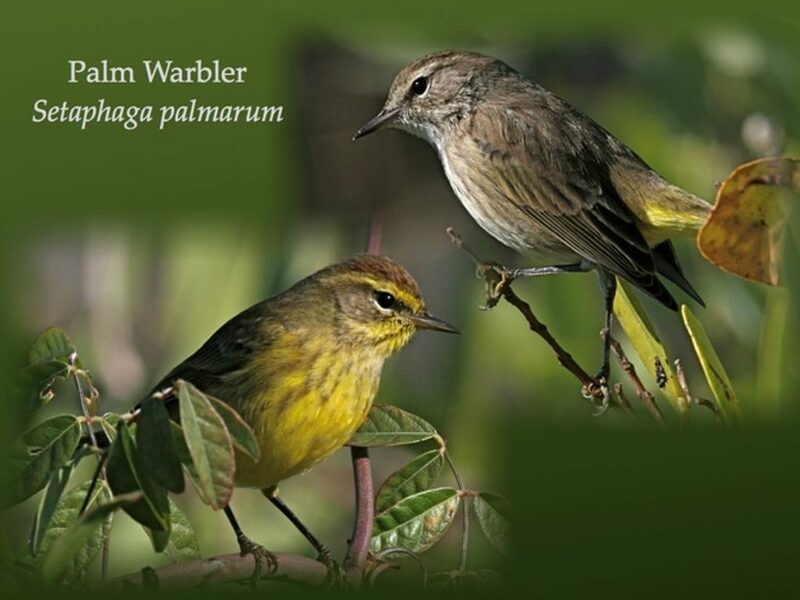 Read more about palm warbler subspecies in Chuck Tague’s blog: Palm Tree Warblers. Can you hear the golden-crowned kinglets in this video? They are very loud but I can’t hear them at all, though I can see their beaks moving. Their voices are at a high frequency I no longer hear. 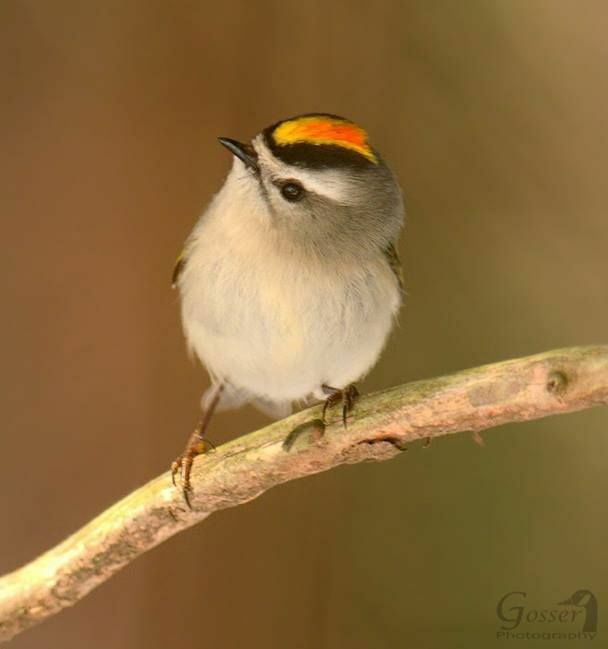 Golden-crowned kinglets sing an ascending, accelerating series of up to 14 very high-pitched tsee notes lasting up to 3 seconds and sometimes ending in a musical warble that drops an octave or more in pitch. This is one of the first bird songs that people stop being able to hear as they age. If you can’t hear the kinglets you are probably over age 65, perhaps younger, and probably have age-related hearing loss. Presbycusis affects 1 out of 3 of people by age 65 and half of us by age 75. The CDC explains that “the most important sounds we hear every day are in the 250 to 6,000 Hz range.” Kinglets vocalize around 8,000 HZ. At birth humans can hear sounds from about 20 to 20,000 HZ but we start losing our upper range of hearing at age 18! Most of us don’t miss sounds above 17,000HZ but some teenagers in the UK will. They capitalized on the age-related hearing difference by creating a “mosquito whine” ringtone that teachers cannot hear. See and hear it on NPR. So now I have two ways to see golden-crowned kinglets singing. I can watch their beaks or I can watch the Spectroid graph on my mobile phone. Perhaps if I point my cellphone in the woods I’d see if any golden-crowned kinglets are out there. You might not see any tree swallows in Pittsburgh yet, but there are flocks in the north at Custards, Geneva Marsh and the Linesville Fish Hatchery. Last Tuesday March 19 Patience Fisher and I were amazed by the millions of midges in the air at Custards. There were so many that they coated my car and attracted hundreds of tree swallows that wheeled over the marsh. Tree swallows (Tachycineta bicolor) are short distance migrants who spend the winter as close to us as coastal North Carolina. The males tend to migrate first and arrive on the breeding grounds to claim territory and fight over nest sites, including bluebird boxes. When the females arrive they pair up quickly and place a little nesting material in their chosen nest site. The pair won’t nest for a few weeks but they like to stake their claim early. 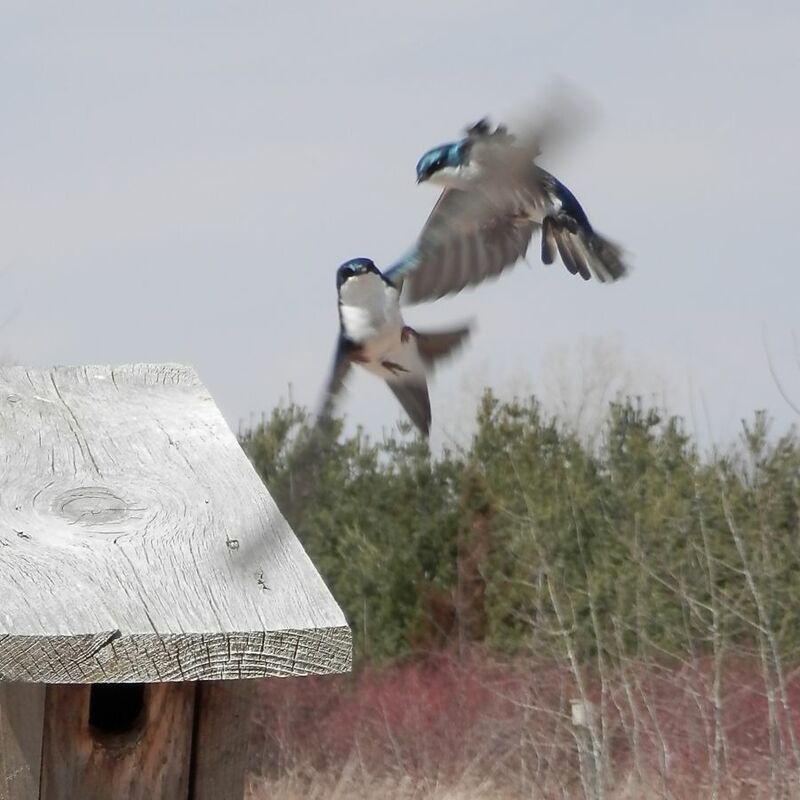 Keep an eye out for tree swallows in the days and weeks ahead … and hope for warm weather so they have enough insects to eat. Tree swallows are coming soon. Seven years ago I wrote about the beautiful white eye ring on a bird named the silvereye (Zosterops lateralis), native to Australia and New Zealand. In Hawaii I saw a similar bird, the Japanese white-eye (Zosterops japonicus). They’re different species in the same genus, Zosterops. It turns out there are 100 species in the Zosterops genus (minus three recently extinct). They range from Africa to India, Southeast Asia, China, Japan, Australia and many islands in the Indian and Pacific oceans. These versatile little birds — only the size of a chickadee — usually arrive at new locations on their own. They showed up in New Zealand in 1832 and 1856, presumably blown east in a storm from Australia. 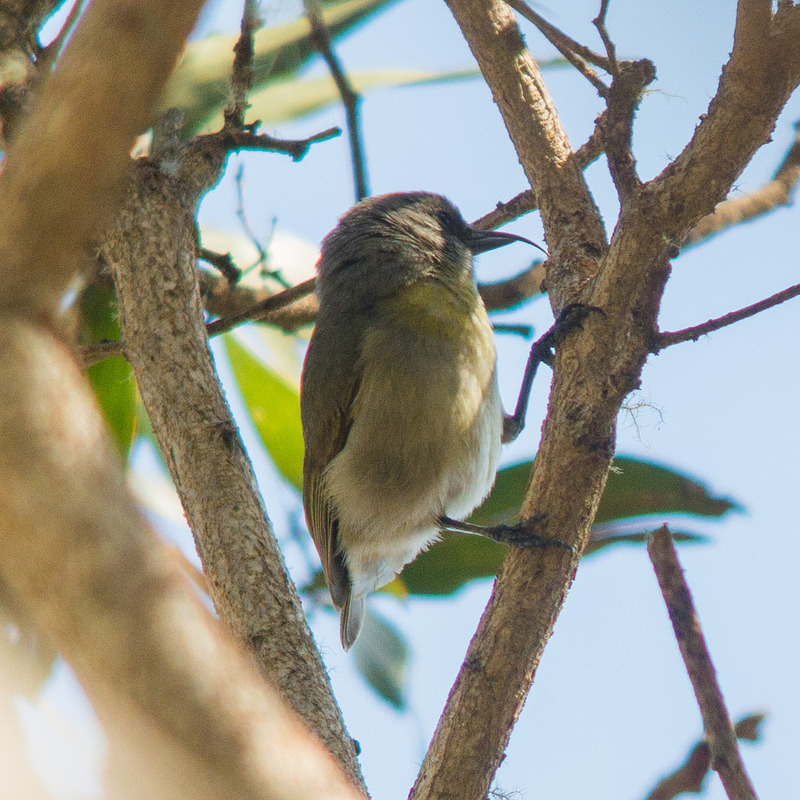 Humans helped white-eyes get to Hawaii. We introduced Japanese white-eyes to Oahu in 1929, but these resourceful little birds have now spread to all the other Hawaiian Islands. Wherever they go, Zosterops tend to differentiate themselves quickly and become new species. 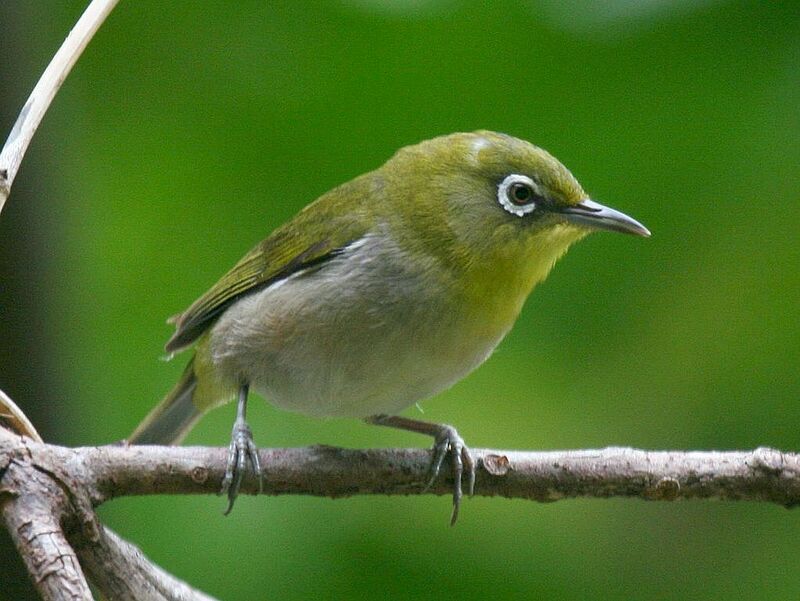 Maybe the Japanese white-eye in Hawaii will morph into the “Hawaiian white-eye” in a few hundred years. See more about the silvereye in this vintage blog: Eye Ring. Have you ever wished for a tool that could accurately identify a single bird’s voice among dozens of singers? You aren’t alone. 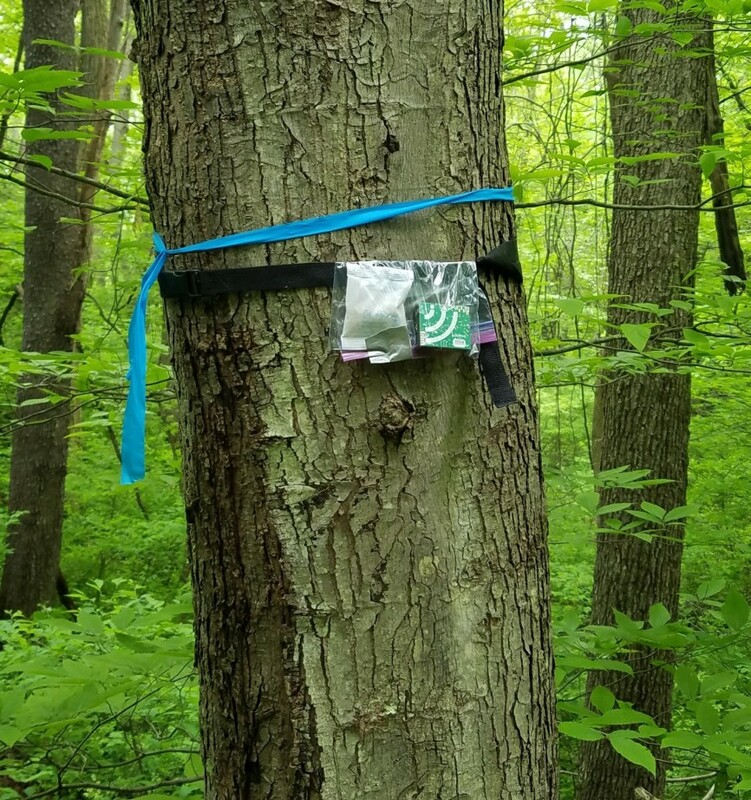 Ornithologists are eager for a way to census birds using field recordings, but the sheer volume of data and complexity of bird song makes this a daunting task. 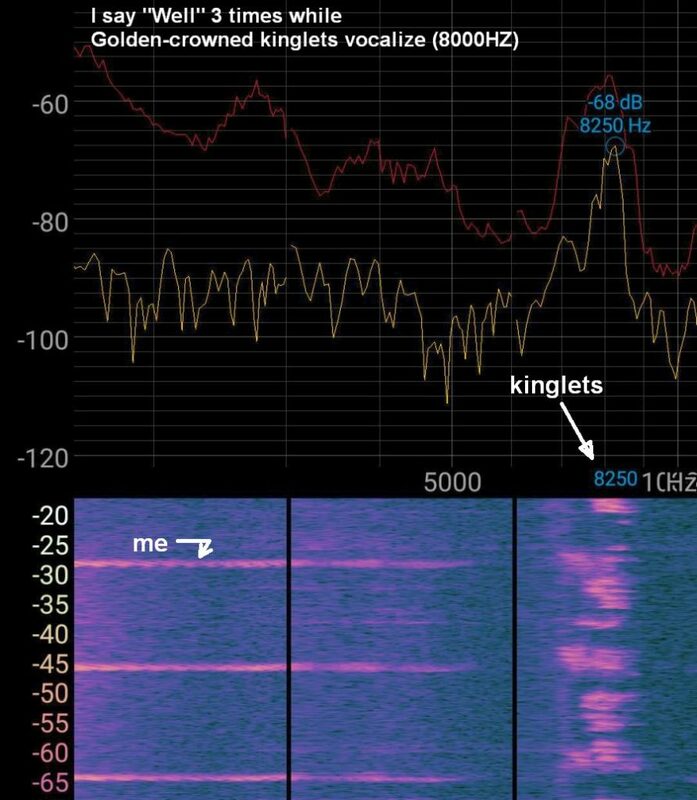 A free tool that can identify huge volumes of song data doesn’t exist yet, but the Kitzes Lab at the University of Pittsburgh is creating one. 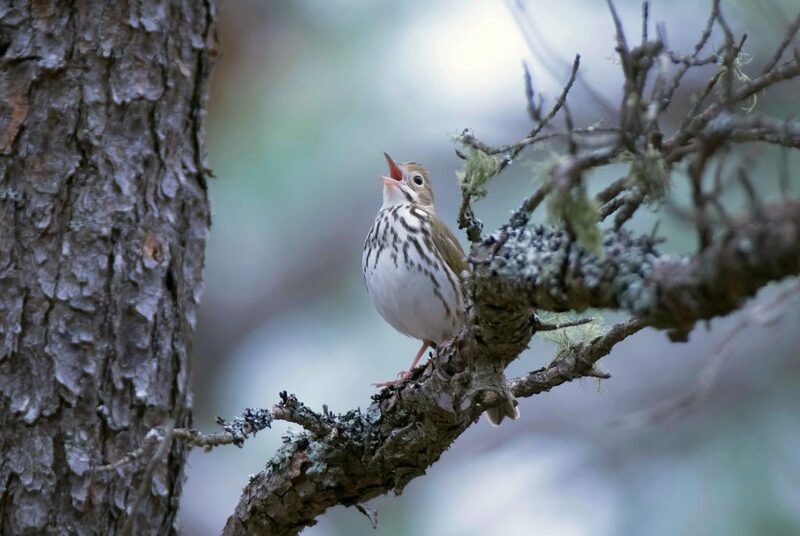 In December 2018 Assistant Professor Justin Kitzes of the Department of Biological Sciences won an AI for Earth Innovation Grant, awarded by Microsoft and National Geographic, to develop the first free open source model for identifying bird songs in acoustic field recordings. Its name is OpenSoundscape. 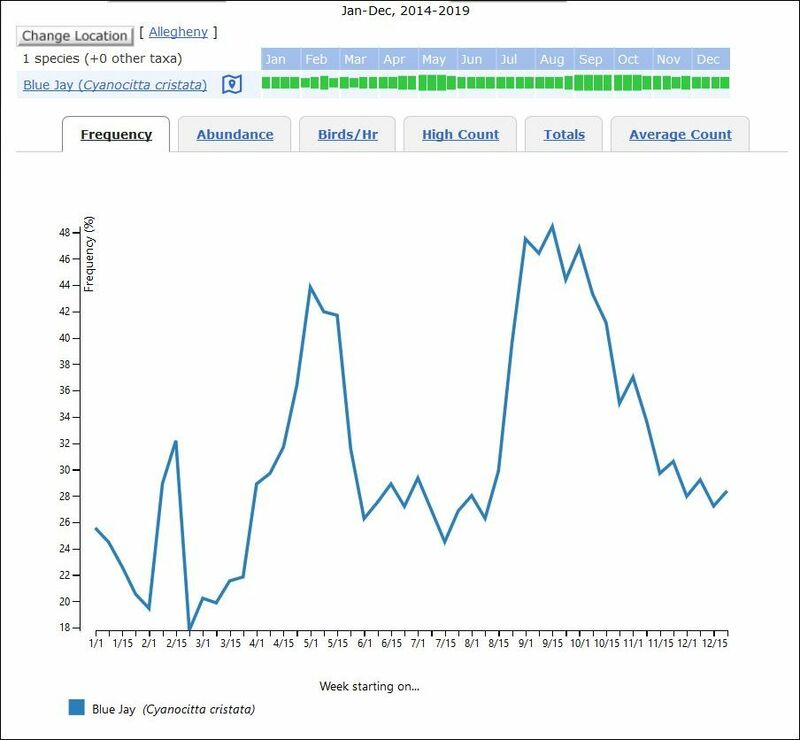 OpenSoundscape uses machine learning, a subset of artificial intelligence (AI), to scan recorded birdsong and algorithmic hunches to arrive at a song’s identity. To do this the Kitzes Lab starts with real life recordings. 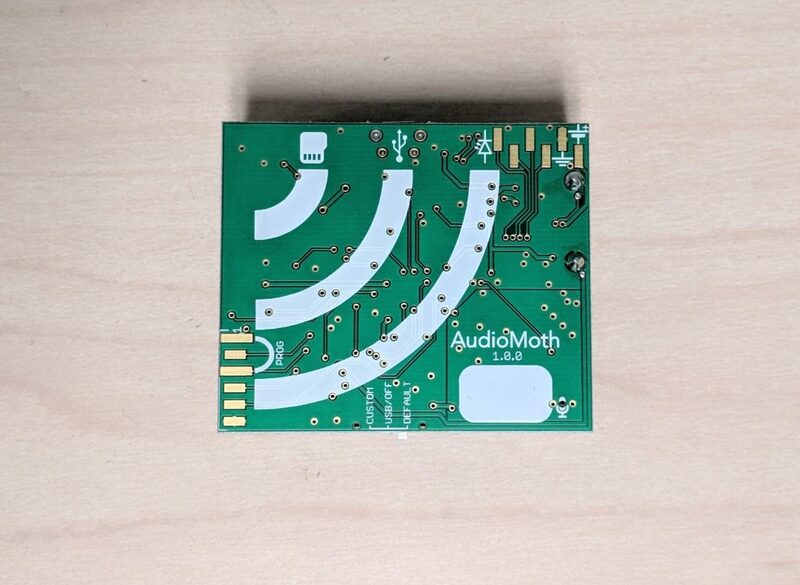 The team places small AudioMoth recorders in an array in the forest, much the same way human observers do point counts except that the Audio Moths are all recording at the same time. Here’s one recording of at least six individual birds. OpenSoundscape is learning how to identify them. It makes a spectrogram of the sound file (below), then picks out each pattern and uses algorithms and the classifier library to identify the individual songs. The more songs it successfully identifies, the better its algorithms become. 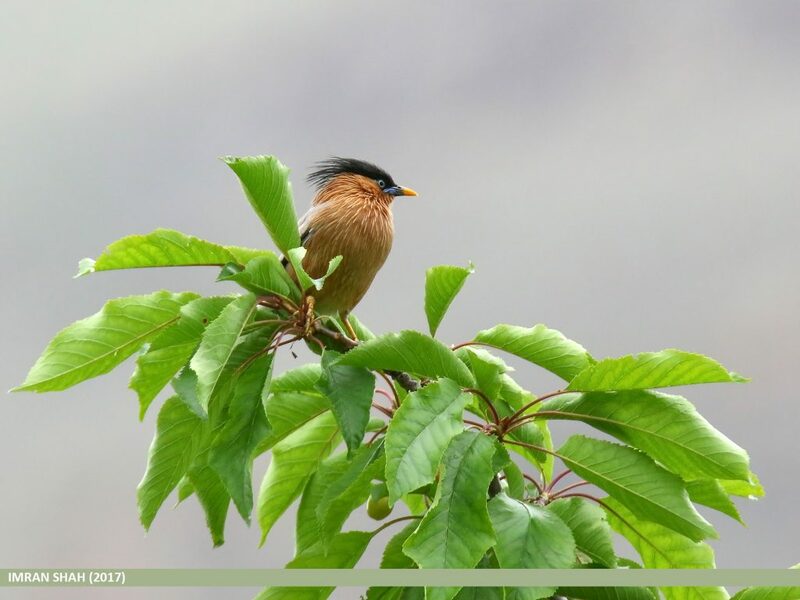 By the end of 2019 the OpenSoundscape models, software, and classifier library of birdsong will be ready for researchers on a laptop, cloud service or supercomputer. Ornithologists will be able to gather tons of data in the field and find out who was singing. p.s. WESA featured this project in their Tech Report on 26 Feb 2019. Click here to listen. 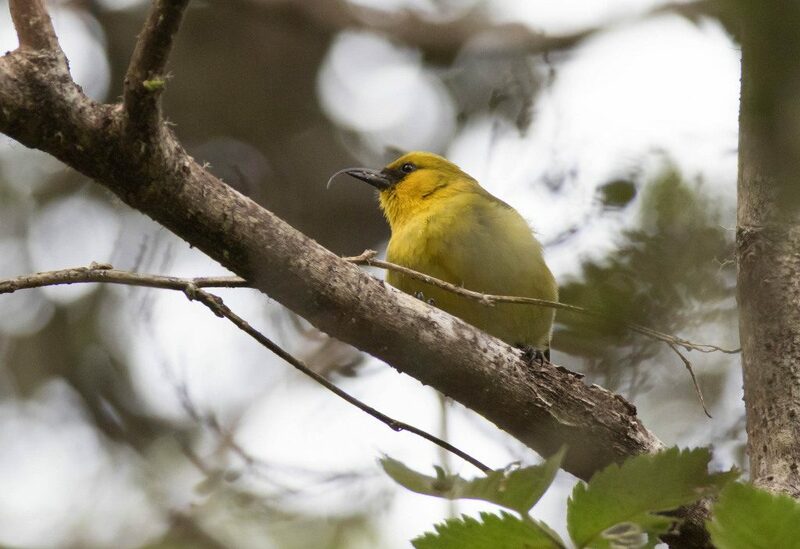 The akiapola’au (Hemignathus wilsoni), or aki’, is a Hawaiian honeycreeper with such a small population and such a restricted range that he may well go extinct in this century. He’s hard to find, of course, but he’s well worth the effort. The aki’s beak is most unusual but it’s perfect for gathering what he eats. He probes for spiders, beetles and caterpillars and, like a sapsucker, he drills rows of holes in an “aki’ tree” and returns when the sap wells up. Despite his similar food requirements the aki’ doesn’t have a woodpecker beak. Instead his lower mandible is short and straight with a chisel tip while his upper mandible is long and thin, curved down, and flexible. Each half of his beak has a different purpose. He chisels and pecks with the lower mandible or props it in place while he probes and scrapes with his upper mandible. As you can see in the top photo, there’s even a small gap between the two mandibles. How strange! The males and females forage in different micro habitats. The females look similar, though paler. The aki’ is listed as Endangered for good reason. His population is small and declining. As of 1995 there were only 800 individuals left on Earth, scattered in severely fragmented areas in the mountains above 5,000 feet. Many things contribute to the aki’s decline including habitat loss from logging and farming and predation by introduced species, especially rats, cats and dogs. The aki’ is also threatened by avian diseases carried by mosquitoes; Hawaiian birds have no immunity to them. The mosquitoes, accidentally introduced to Hawaii beginning in 1826, cannot live in the cold climate above 5,000 feet. 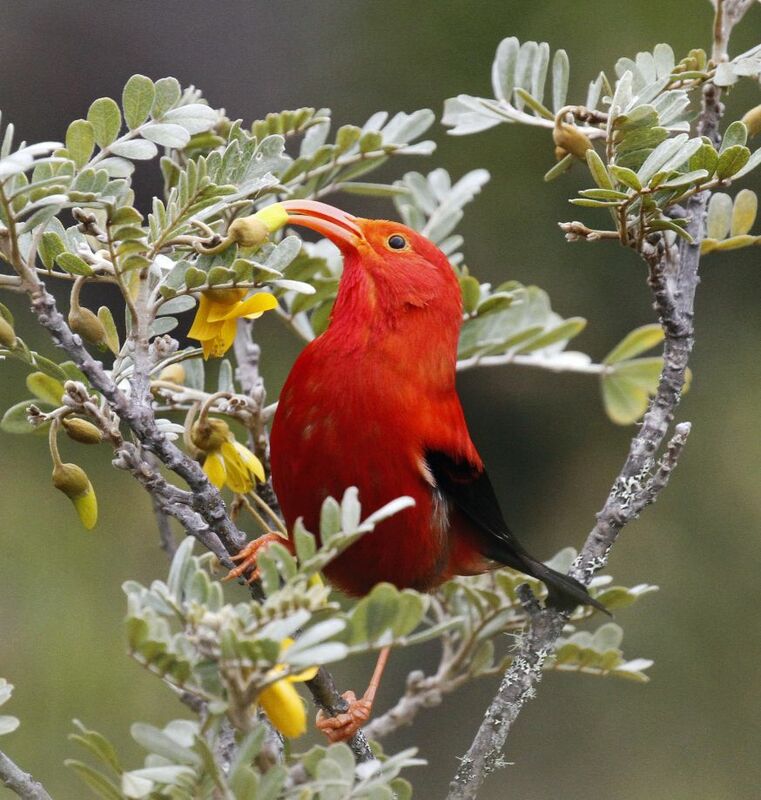 That’s why Hawaiian honeycreepers like the aki’ still survive there. Unfortunately climate change is warming the Hawaiian mountains and the mosquitoes are moving up. How long will we still be able to find this beautiful bird with such an unusual beak? p.s. I saw an aki’ yesterday. Yay! 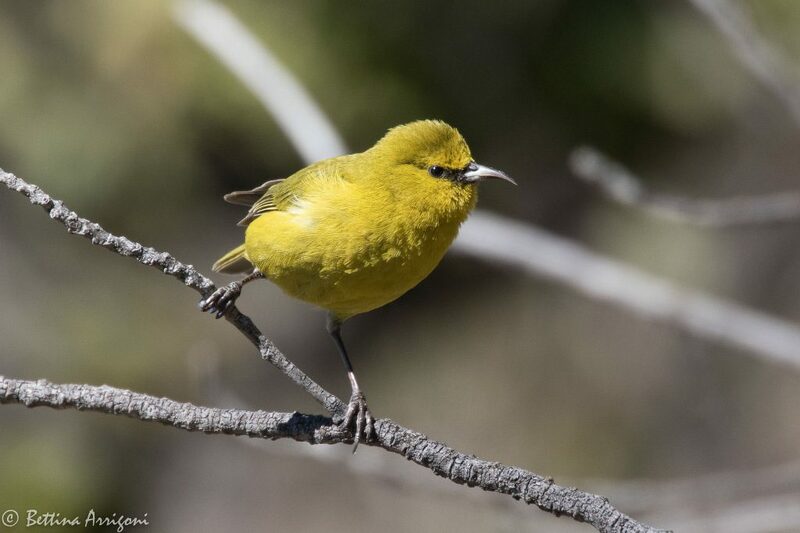 Today our VENT birding tour has special permission to enter the Hakalau Forest National Wildlife Refuge on the eastern slope of Mauna Kea where there are more native birds than anywhere else on the islands. We’re going to see a lot of birds and a lot of them are endangered. The refuge, founded in 1985 to protect Hawaiian rainforest birds and their habitat, is closed to the general public because the ohi’a trees (pictured above) are dying of a fungus that’s spread too easily by humans. Rapid Oh’ia Death kills the trees within a few days or weeks. Hundreds of thousands of trees have died since 2013. This is especially scary because the ohi’a is the most common native tree and so many birds rely on it. Many of them have unusual beaks. The I’iwi (Drepanis coccinea), at top and below, is nearly the same color as ohi’a flowers. Vermilion red with a decurved bill that’s perfect for probing flowers and sipping nectar, he perches like a songbird or hovers like a hummingbird. He was so common when Polynesians first arrived in Hawai’i that they made his feathers into royal cloaks. 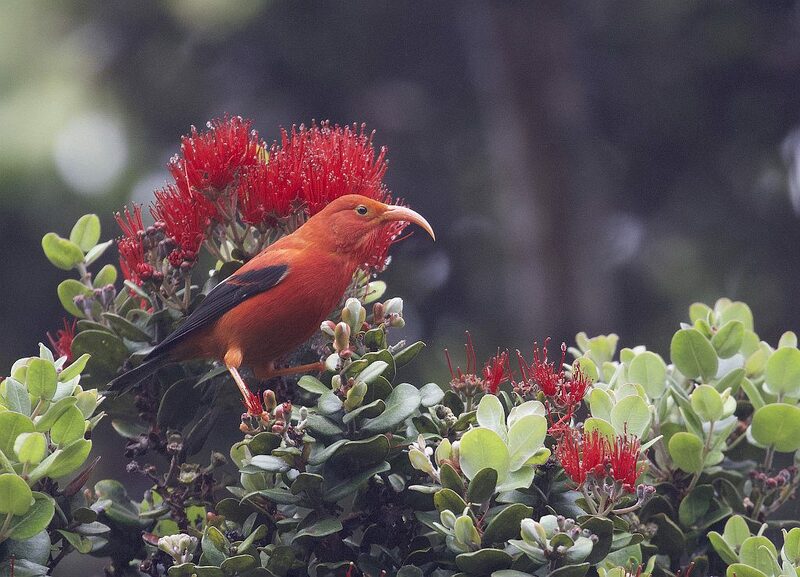 The ‘apapane (Himatione sanguinea), below, also feeds on ohi’a flowers and is red and black like the i’iwi. However his color is scarlet, his undertail coverts are white, and his dark bill has a gentle curve. 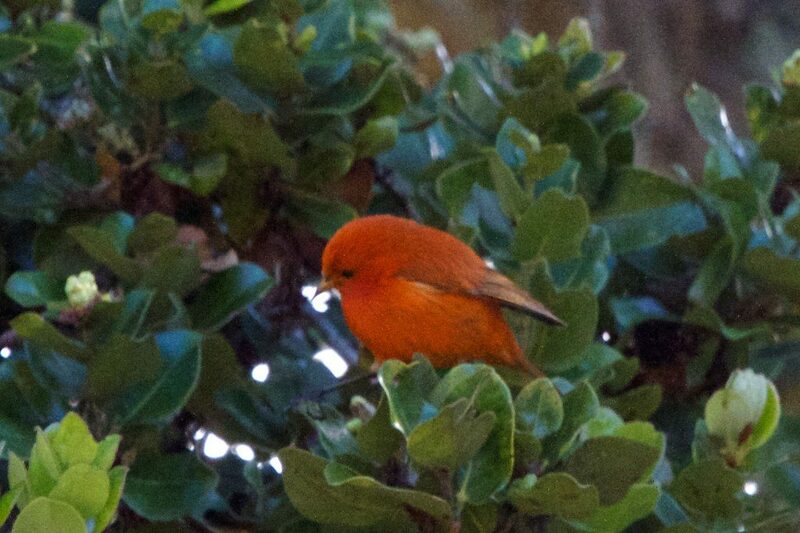 The Hawai’i akepa (Loxops coccineus) is a tiny orange-red bird with brownish primaries. 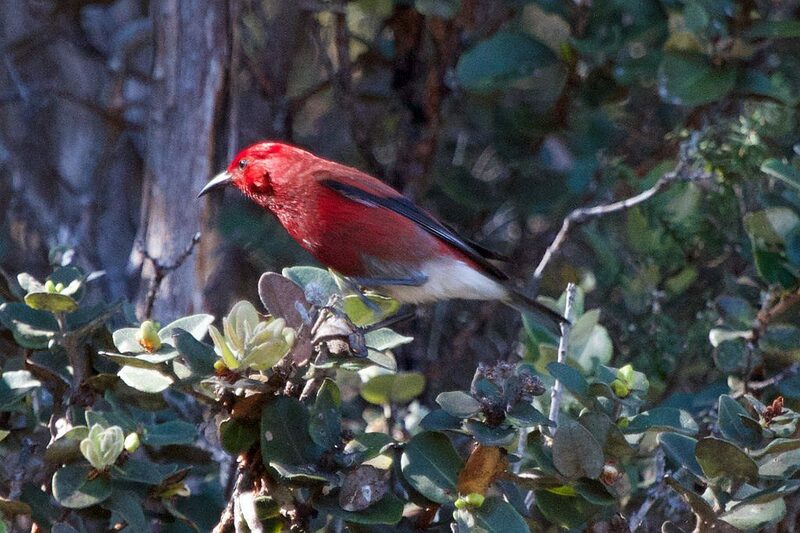 This endangered crossbill feeds on spiders, insects and nectar in the ohi’a forest. Yes, his bill is curved and crossed! And finally, the Hawai’i amakihi (Chlorodrepanis virens) is certainly not red but he has a curved beak that’s useful for gleaning, probing, and sipping while he eats spiders, insects, sap, nectar and fruit. He’s a versatile bird whose population is doing quite well with 800,000 to 900,000 on the islands. What do these birds have in common other than their curved beaks? They are all Hawaiian honeycreepers. As I mentioned yesterday, our Hawaiian tour checklist has 108 birds on it of which 46 are introduced. Yes, 42% of the birds we expect to see would not be in Hawaii if people hadn’t brought them there. 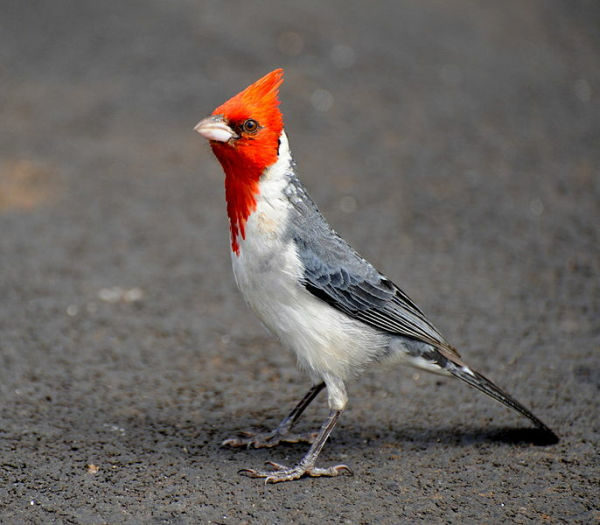 The red-crested cardinal (Paroaria coronata), above, is one of them. A member of the tanager family native to northern Argentina, Bolivia, southern Brazil, Paraguay and Uruguay in South America, he was introduced to Hawaii in 1928. Being a land-based bird, he was stuck on the islands as soon as he got off the boat but he’s made himself at home in disturbed habitats and urban parks. Fortunately he’s not considered invasive so I’ll be happy to see him in Hawaii. On the other hand, two bulbul species introduced to Hawaii in the 1960’s are not a happy sighting. Both have become invasive. 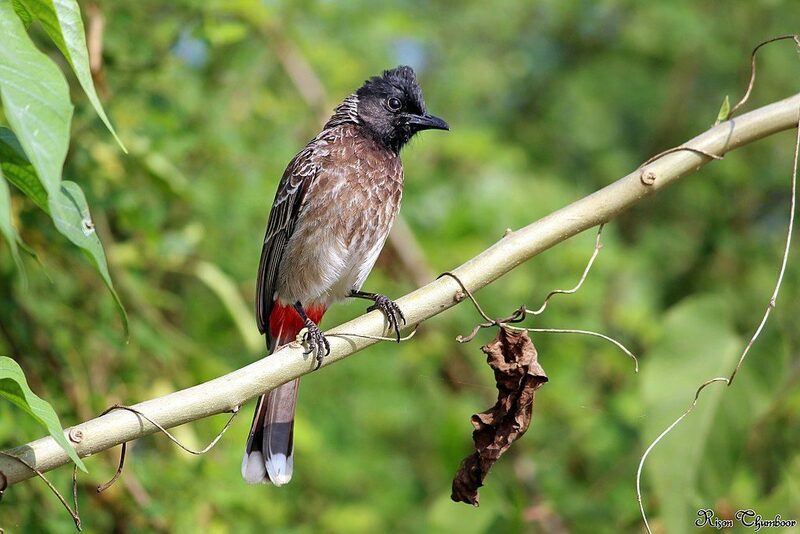 The red-vented bulbul (Pycnonotus cafer) is a prolific resident breeder of the Indian subcontinent who’s been introduced in tropical areas around the world. On the Pacific islands he’s become invasive and is now one of the world’s 100 worst invasive species — a dubious distinction. 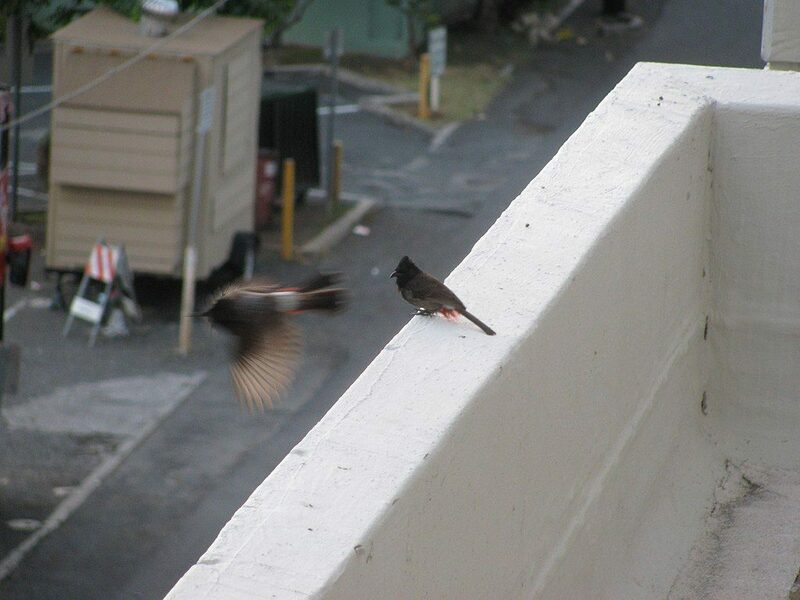 Red-vented bulbuls are easily found in urban Honolulu. 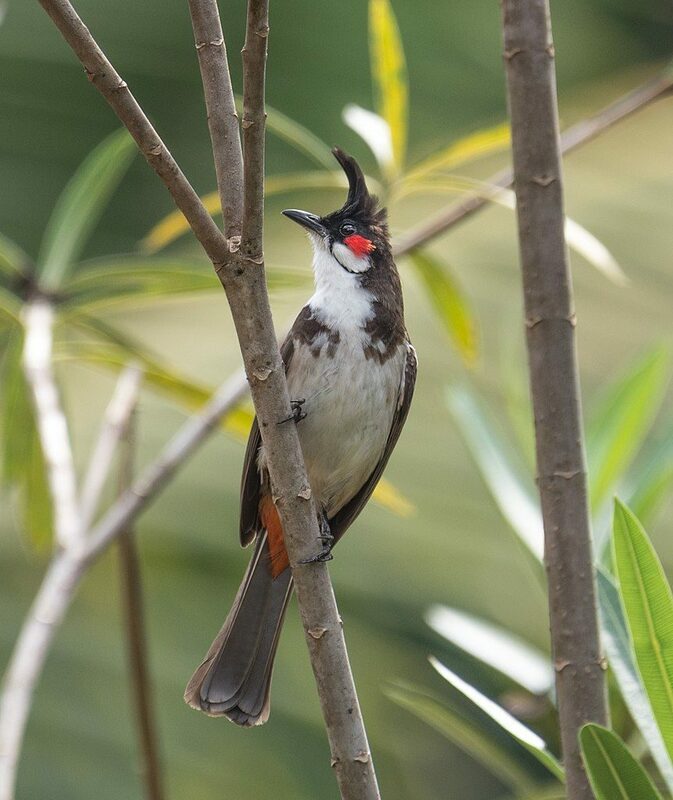 The red-whiskered bulbul (Pycnonotus jocosus) is a fruit-eating bird of tropical Asia who’s not in the top 100 pests worldwide, but he’s invasive in Hawaii. The two bulbul species made a difference in a very short time. According to Wikipedia, they changed the color of monarch butterflies in Hawaii over a period of just 20 years. The bulbuls prefer to eat orange-colored monarchs so orange ones are scarce now and white morphs are common. 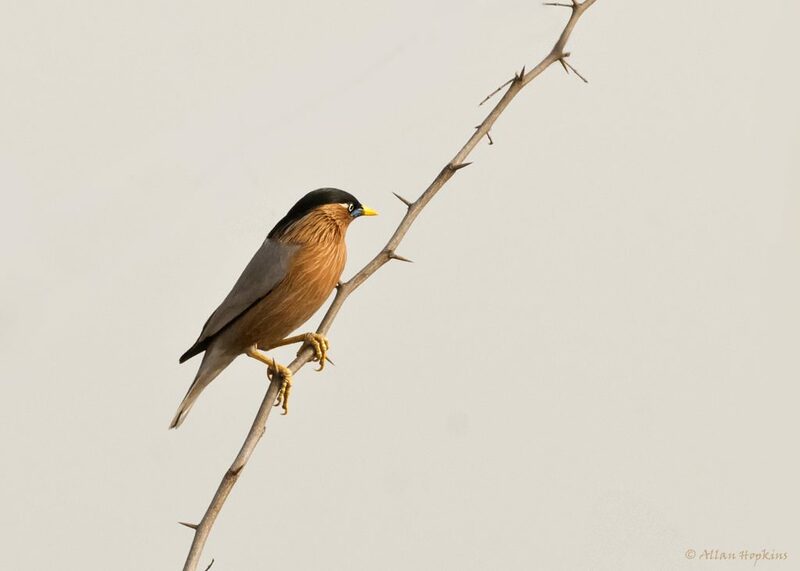 The brahminy starling (Sturnia pagodarum) from the Indian subcontinent was named for his black crest because it resembles the sikha hairstyle worn by Brahmins. He looks like a Brahmin when his feathers are at rest (above). However, he raises his head feathers frequently. Watch his crest as he sings in this video. He’s a pushy bird whose shape, behavior and song remind me of our European starlings (Sturnus vulgaris). He’s not in the same genus … but close. In the winter of 2012 Pittsburghers noticed we had very few blue jays in our area. It was such a mystery that I posted an article in February asking folks to tell me if they’d seen any blue jays lately. Seven years later the responses are still coming in. Our blue jay count surges during spring and fall migration because a lot of them breed north of us. In Allegheny County (Pittsburgh) there’s also a mysterious mini-surge every year in mid February. What’s that about? See seven years of blue jay reports and musings at Have You Seen Any Blue Jays Lately? 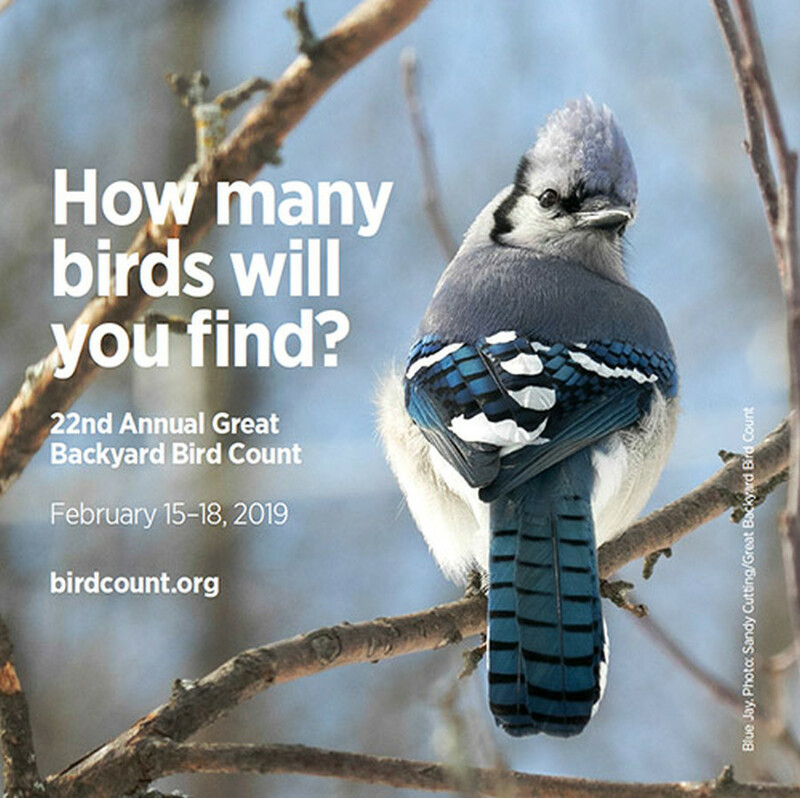 Count your own blue jays during the Great Backyard Bird Count this weekend. How many birds will you find?